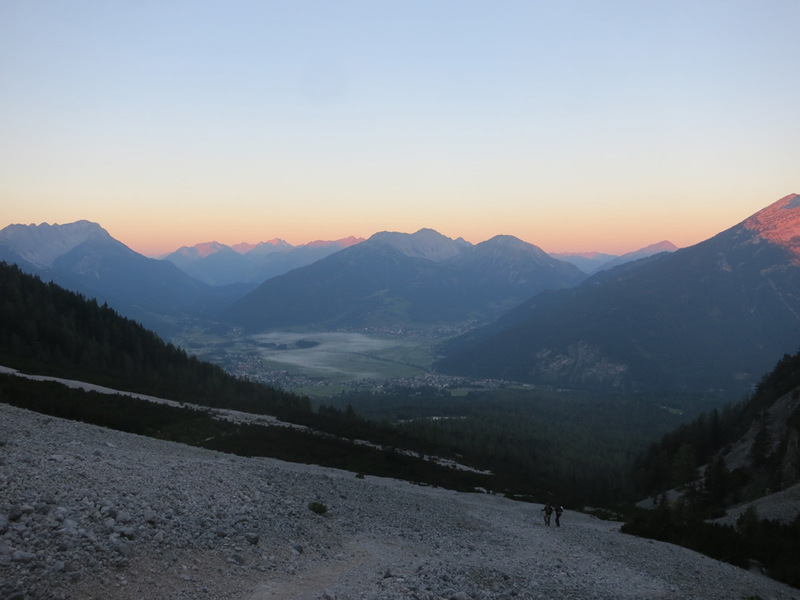 ‘Where there is a will there’s a way’, I thought, got up a 4 a.m. yesterday and started my hiking tour to the Zugspitze, the highest German mountain. 1800 meters, around 6000 feet in altitude that means, for someone like me not a small task! I got up in pitch black darkness. Only the moon was shining bright. 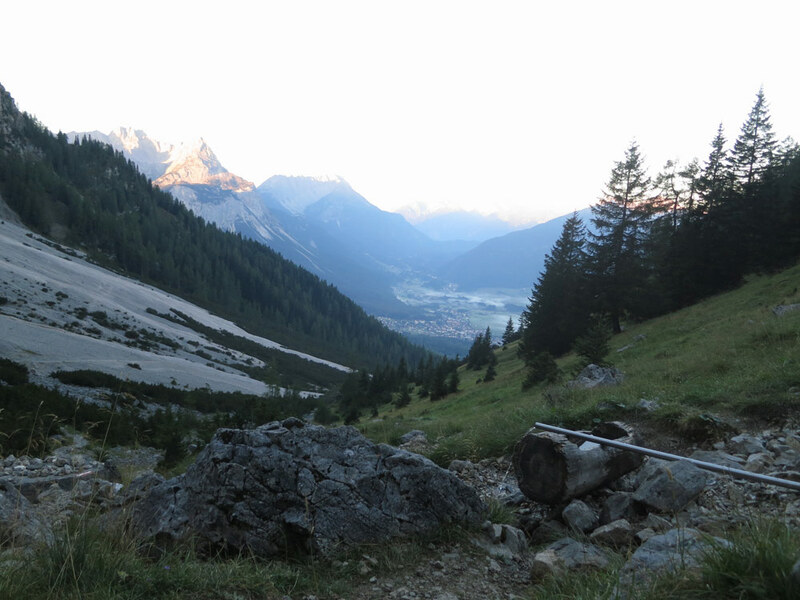 Then when I started walking there was a hint of light already and since I knew well the first hour of the path I left my head light in the backpack. 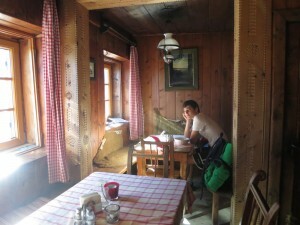 When the day light was sufficiently strong, I set down and had a small breakfast: some dried sausage, „Landjäger“ (simple taste but not bad!) and some bread, „Vinschgerl“ (some spiced heavier bread, a delicatess from the Vinschgau, a valley in South Tyrol). I was sitting on a tall slope between mountain pines, with a grandios view of the valley of Ehrwald, where I live half time of the year, a nice location half touristy, half village of farmers and artisans. Then I walked further, came to a simple water source, spattering out of a metal pipe, surrounded by a surprisingly lovely meadow so high up. I heard some sheep bells but couldn’t see the animals till much later, high up where there were mainly rocks and very little grass. Now I reached a mountain crest with view also to the North. 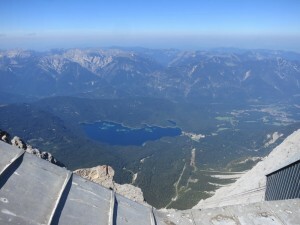 The beautiful weather meant a panorama of hundreds of peaks in all direction and the green-blue water deep down of the lake „Eibsee”, which lies west of Garmisch-Partenkirchen. It’s right now my favorite lake because it has several small islands on the North side and you have the feeling you are at a Norwegian fjord with nice rocks strewn around. The path now wounded around the north side of the ridge, where is was a bit exposed but metal cables helped to feel safe unless one would have a pronounced fear of heights. 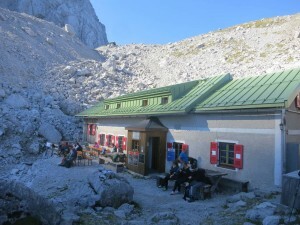 Soon later – I was now huffing and puffing for four hours – I arrived at the “Wiener Neustädter Hütte“. 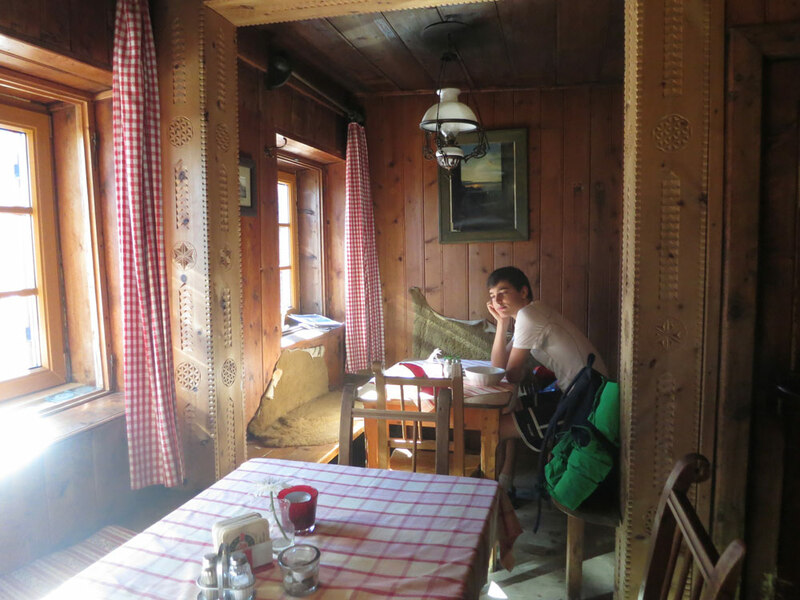 It’s a classic old mountain hut with a lot of history, wood carvings and an atmosphere of a dignified personality, and where you also can stay over night. The quarters consist of wooden tiny rooms with bunk beds and red checkered linens. 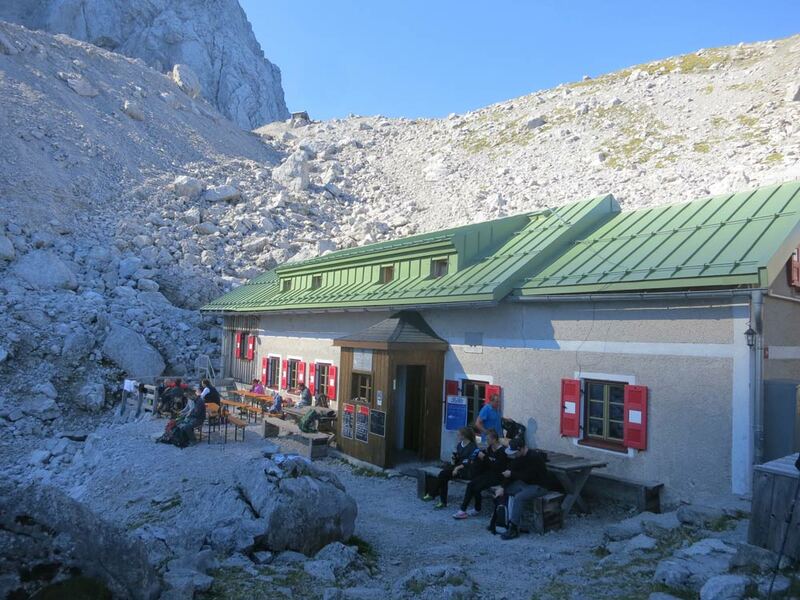 I had a big mug of peppermint tea and then a big bowl of „Kaspressknödelsuppe”, a local speciality, which is a soup with a big dumpling that contains also some cheese fried in a pan and then added to a delicious bouillon. Earlier then expected, my 19 year old son Finn joined me. He had started later and had walked up in less than half the time it took me up to here. He also carried our gear up, kindly, as is his second nature, and that was a relief for me since it helped me to save my strength. 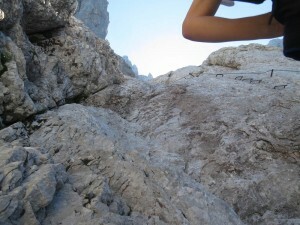 Soon later, we put on our borrowed climbing harness and helmets as protection against falling rocks and then we started for the second part of the tour: the mastering of a wild landscape of vertical rock walls with some small alcoves in the folds of the limestone. The main fear I had was not so much the anticipation of some exposed steps over a gaping abyss but that I would be in the way of numerous other climbers who would see a terrible obstructive plug in me on the route to the top. What if 100 people had to wait behind this old „granny“ who had the crazy idea to climb like a young monkey? Would I have to listen to calls like „Get out of our way, Mam!“, „Hey, what are you doing here?“, „Are you nuts?“. My son reassured me that he would tell them to shut up, and I would not have to worry at all. ‘O.k., let’s just do it!’, I thought. 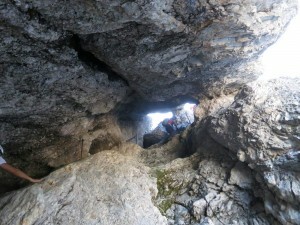 It turned out that the route went through a cave and then through a hole up in a fairly straight up alcove of a wall, but the big metal grips and single metal rods were so solide anchored in the rock that the climb was fairly easy. All what was necessary was not to be scared of heights and to climb step by step looking for the next safe hold. And the nice thing was that this climbing path was like an ant trail overcrowded with people and no one cared if I was slow or not. People came down, people went up, some were fast, others slow and no one in this tangle of traffic really paid attention to this one extra obstruction, poor me. Toward the end I became slower and slower and then super slow with maybe more breaks than walking steps but finally, at 2 p.m., even I had made it! 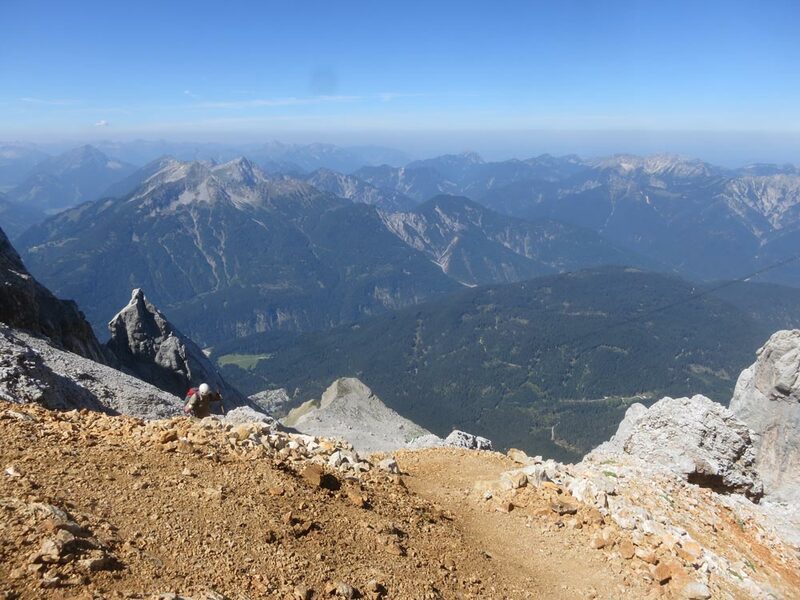 I had asked Finn after half part of the climbing section to go ahead, and there he was, at the top, a mountain ridge, from where you could look in all directions over half the Alpes. What a gorgeous view! Far down, one heard the voices of people sledding in the glacier snow on the „Platt“, a declining plateau on the East side of a half circle of rock peaks, all nearly as high as the main peak. 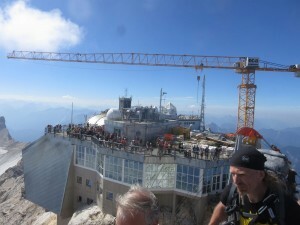 Now, all we had to do was to take the very last few steps to the building where three cable cars from three sides of the mountains come together, but I must admit that these last few steps meant a big physical effort for me. 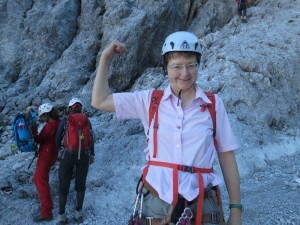 Finally: „Three, two, one steps – finished, over!“ – what a big relief! 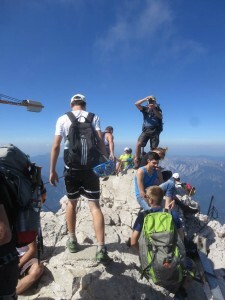 Big mountain – small peak! ‘Every big mountain has a small peak!‘, I thought by myself while standing next to the golden cross that was barely a few meters higher than the mountain buildings for tourists next to it and was hopelessly overcrowded. The rest of the day was a piece of cake since we took the cable car down. Soon we enjoyed a nice shower, then the soft feathers of our beds and today, one day later, feel only a bit slower than normal but without pain or even sore muscles. It was a dream of an achievement for me. 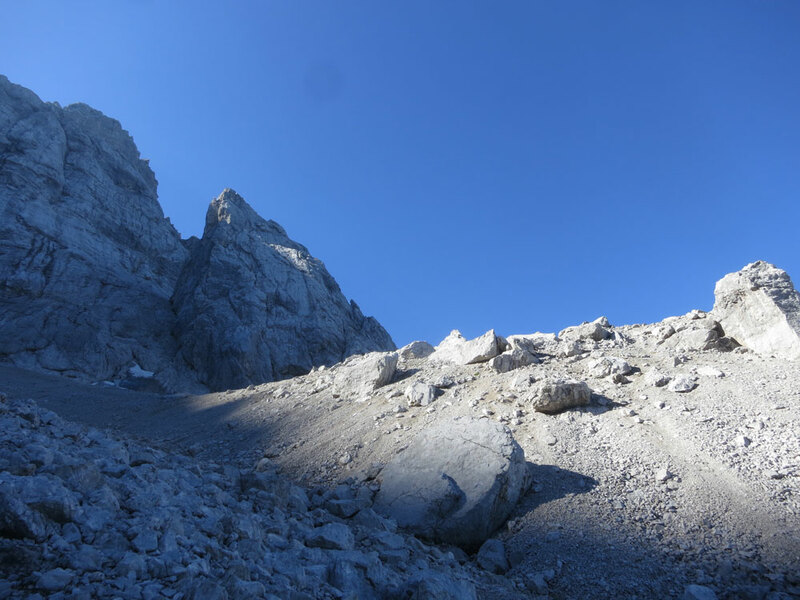 Now, while looking out of the kitchen window I can say: „Yes, I know you, buddy!“, living at the foot of this mighty giant, the Zugspitze. And what is next? There is still one more mountain to climb. It sits on the south side of our valley and lures me every morning with its beautiful cone shaped rock peak, looking into our bed room window. The climbing is supposed to be a bit more challenging although shorter. ‚Hurry up,‘ I think, one more is waiting!‘ One more, and that’s it! At the end, my favorite picture: rock landscape of a beautiful mountain! If you point ’n click on these pictures, you get the bigger version!